The Willoughby DF-1812-FA Small Profile Handicap-ADA-Compliant, Front Access Drinking Fountain is a single-user fixture for use in security environments where a mechanical chase is either non-existent or difficult to access. Fixtures are all-welded, fabricated from 14 gauge, Type 304 stainless steel polished to a #4 satin finish. 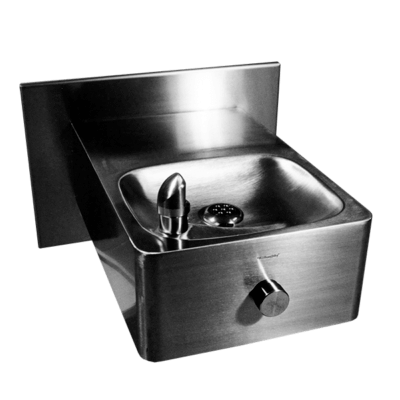 Standard DF-1812-FA fixtures come with a rounded rectangular basin, CDB drinking fountain bubbler, PSL1 single temperature non-metering valve, RPT slip-joint P-trap (1-1/2” F.I.P. ), with anchoring through the included mounting plate (anchoring hardware by others). The DF-1812-FA drinking fountain can be supplied with optional features including: plumbing, mounting guides, etc. All valves and plumbing will be factory installed inside the fixture cabinet (unless noted). All connections between the outside plumbing and the fixture are made within or at the rear of the vandal-resistant, stainless steel fixture. Removable bottom panel attached w/ security screws allows access to all fixture plumbing and mounting points inside. The DF-1812-FA drinking fountain meets all applicable ADA and ANSI accessibility guidelines when mounted at the correct applicable rim height above the finished floor (installation by others).